In these super high roller events with the eye-popping buy-ins, it’s sometimes easy to forget how mentally challenging tournament bubbles can be. These players have seen and experienced it all — most of them, anyway — but that doesn’t necessarily prevent extra adrenaline from flowing when the money draws near. Such was the scene as Day 2 of the PokerStars Championship Barcelona €50,000 Super High Roller came to a close, ending with the bubble bursting in the last level, then with nine players left Koray Aldemir finishing with the chip lead to enter tomorrow’s finale. Aldemir’s baseball cap was a little Goofy, but the German’s play was anything but as he ended the night with a big stack of 4.54 million. Seems long ago when Day 2 began and Adrian Mateos was the chip leader. A few last-minute registrations brought the total number of entries to 86 (including 19 re-entries), making the prize pool a whopping €4,129,290. The top 11 stood to divide those riches, with €1,135,500 going to the winner. First things first, though. Namely, whittling the field down to that money bubble and then bursting it. Along the way Mateos saw his stack slide, then a big chunk of it go over to Team PokerStars Pro Igor Kurganov in a hand that saw both make full houses on the river, but Kurganov’s aces full of kings were better than Mateos’s aces full of queens giving Kurganov a huge double. That hand helped push Kurganov into the chip lead as the afternoon wore on, while Mateos would be on the rail before dinner. Stefan Schillabel, Ahadpur Khanghah, Manig Loeser, Rafael Moraes, Erik Seidel, and Charlie Carrel also joined the march to the exits as they worked down to the last two tables, with Christopher Kruk then Koray Aldemir taking over the role of chip leader. 2016 November Niner Vojtech Ruzicka fell in 16th when he was also run over by the Aldemir train, followed by Alexandros Kolonias (15th), Jack Salter (14th), and Mikita Badziakouski (13th). 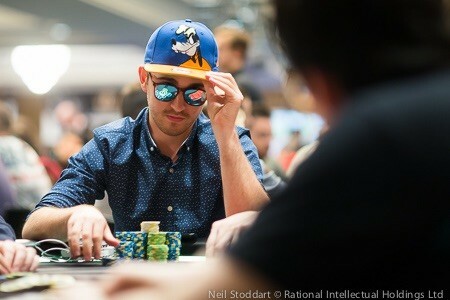 It was during that stretch players engaged in earnest in table talk regarding bubbles, with Isaac Haxton in particular calling attention to how many times he’d bubbled recently (the EPT Prague High Roller last December springs to mind) and expressing a kind of fatalistic attitude toward the possibility occurring again as he became short-stacked with 12 left. Haxton hung on, though, and had a few more chips than did Mikhail Rudoy when the latter found himself all in with pocket kings and at risk versus Kruk’s ace-queen, then seeing his kings cruelly cracked by an ace on the river. “You’re all welcome,” grinned Kruk, and Haxton was no doubt glad about what had transpired. Haxton would soon be all in himself, then out in 11th after losing a hand to Kurganov. Kurganov also took care of Daniel Colman in 10th, meaning Aldemir will lead the final nine to start tomorrow though Kurganov isn’t too far behind with 4.17 million. There’s one other red spade who has made the tournament’s last table, too. You might have heard of him. Things were up and down in the early going today for Daniel Negreanu, but he ended well and with 1.71 million remains part of the mix with one day to go… again.